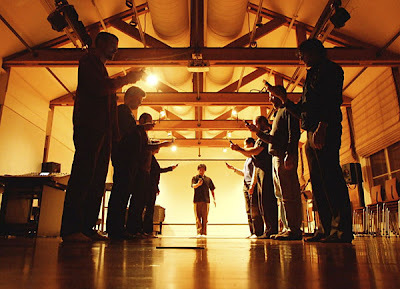 MoPhO is an acronym for the "Mobile Phone Orchestra" based at Stanford University. They perform their music live on iPhones. MoPhO's music director, Ge Wang, earned his PhD in computer science from Princeton. Teaching as an assistant professor of music at Stanford's Center for Computer Research in Music and Acoustics (CCRMA), Professor Wang is also founder of the Stanford Laptop Orchestra and a hi-tech entrepreneur. His start up company, Sonic Mule (or SMULE), was founded in July of last year to explore interactive sonic media. MoPhO is not your fathers' ring-tones. But what happens if you don't own an iPhone? 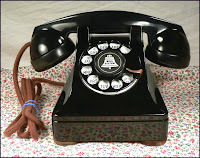 I still have a "Lucy telephone" - General Electric model 302 series. It's elegant, sturdy, and comes in three colors: black, black, and black. The Lexington Arts & Crafts Society (founded in 1935) had a gallery opening and reception on Sunday. It was their sixth biennial juried show for Massachusetts-based clay artists. 78 pieces were on display, and those were selected by juror Jim Lawton from a pool of 106 artist applications and 285 entries. Whale Sounds by Suzanne Stumpf. There was an amazing variety of work. The place was packed! Wall-to-wall art enthusiasts. It’s foggy on this Sunday morning. I’m usually up early on the weekend and have a little time for reflexion and to type a few thoughts into this blog. The ailing economy has forced hardship on a lot of people, but fortunately I am surviving. However I can report first hand that it does not seem like the job market is improving at all. I just filed for my 39th week of unemployment, which means that I have been looking for work for nine months. Even with recent extensions of unemployment benefits that were approved by Congress as part of the stimulus package, I will exhaust my benefit this coming summer. The clock is running out, and the reality of my situation coupled with the daily onslaught of grim financial news weighs one down. I often go to concerts for therapy. Good music provides a psychological lift. I find that listening to musicians perform live music is an excellent defense against the current recession. At least it gets me out of the house. Aside from all of the rich musical events that occur in Boston-Cambridge, the local suburbs are becoming a hotbed of classical music culture. One such example of this blooming musical activity was the musical soiree that Willemien and I were invited to attended at the home of Nancy Burstein on February 27th, 2009. Nancy periodically opens up her living room to host performances by a range of eager musicians and vocalists – some professional and some amateur. It’s an inspiring evening of fun, and may I add it makes for some excellent food and company too. The highlight that evening was a energetic performance of the Beethoven 4th Piano Concerto by a visiting Israeli composer/pianist named Rami. He was joined by my friend Eric Schwartz who expertly provided the orchestral accompaniment (you can read more about Eric in the blog post titled "Power Lunch"). Rami performed on Nancy’s Steinway model M, while Eric played orchestrally on an upright piano sitting near by. Other performers included a recorder trio, Willemien playing a Telemann duet on flute, and soprano Marion Leeds Carroll, who sang Schubert lieder. The following Friday evening, on March 6th, Willemien and I attended a wonderful recital by flutist Jill Dreeben. It was part of a group of concerts curated by Pasquale Tassone called the Menotomy Concert Series. The series takes place in Arlington’s historic Town Hall – which has surprisingly good acoustics. Ms. Dreeben was joined by Irina Chelnokova (Piano), Sandi-Jo Malmon (cello), Diane Heffner (clarinet), Beth Welty (violin) and Dani Rimoni (viola) in a program of diverse chamber music. The program included some interesting music from the 20th century French repertory and a set of four new pieces for solo flute by Arlington composer John Kusiak. The Prelude, Recitative, and Variations Op.3 by Maurice Durufle was unknown to me, but a real gem. I really appreciate that the concerts in the Monotomy Concert Series are free and open to the public (although a voluntary contribution is gladly accepted in a jar at the entrance). Occasionally I’ll splurge on entertainment. Last evening as I arrived at the entrance of a local chamber music concert by Winsor Music I took notice that the ticket prices were a little more than I usually allow myself to spend. There were discounts for students and seniors, but all other tickets were priced at $20. Impulsively deciding to go for it, I looked at the ticket agent and requested “just one” - hoping that she might mistake me for either a student or a senior. Unfortunately, I apparently fall within that narrow window of people too old to pass as a student, and too young to pass as a senior (although I once proudly held AARP a membership card). Given my state of mind, $20 was not an inordinate amount of money if the concert would lift my spirits and provide a temporary escape from reality. But it’s unfortunate that there wasn’t a ticket discount category for the legions of “structurally unemployed.” That would have been a nice touch in these times of financial stress. The concert was the last event in a five-concert chamber music series produced by Winsor Music, Inc. The group was founded in 1996 by oboist Peggy Pearson and provides concerts at the Follen Community Church in Lexington as well as St. Paul’s in Brookline MA. The ensemble is superb, and comprised of the crème de la crème of musicians from the Boston-metro area. Boston is blessed to have a rock solid community of professional classical musicians who seem to be omni-present in the cultural affairs of the region. The same faces appear and reappear continually in different contexts throughout the concert season. I’ve heard various subsets of these gifted musicians in performance with BMOP, Fromm Players at Harvard, Musicians of the Old Post Road, the Composers Conference at Wellesley College, Longy, Brandeis New Music, New England Conservatory, and Emmanuel Music. The list could go on indefinitely. What’s interesting about this configuration of musicians that perform with Winsor Chamber Music, is that they seem to form an extension (or satellite) of the Emmanuel Music organization. I noticed that Leonard Matczynski is on the Board of Directors for Winsor. Lenny is a violist and the Executive Director for Emmanuel Music where he contracts musicians and assists the Artistic Director. It is almost as if the strategy of Winsor Music is to spread the Emmanuel Music artistic and business model, and transpose their success out into the realm of the burbs. The management of Winsor Music, Inc. may have learned much from the musical “incubator” championed by the late Criag Smith at Emmanuel Music. Smith’s vision, organizational model, and mission statement seems to have worked exceedingly well in Boston. It appears that it can work equally well, perhaps even better, in the affluent suburbs. The outskirts of the city represent a fertile artistic space. It’s a large cultural void yearning to be filled, but the implementation needs to be grass-roots oriented and tied-in with the community to work. Prospective patrons are much more likely to support their own home-grown talent. The similarities between these two organizations (Emmanuel Music and Winsor Music) appear to go well beyond a common cadre of musicians and organizational philosophy. Emmanuel and Winsor share a similar appetite for musical repertory and draw from a well-established network of notable Boston-area composers and artists. While their artistic administrators appear to take a broad view of classical music and expire to a world-class interest in repertory spanning from the Baroque-era through contemporary works, Winsor Music also actively engages established local-area composers and artists. For example, they commission new Hymns, and the one featured in this concert was composed by James Matheson (b. 1970). It’s the real deal. While this was the first concert by Winsor that I have attended, I have been well aware of their activities over the years. For example the Boston Globe ran a feature article on this particular concert. In a time when the classical music barely receives mention or reviews in the major press, it is quite remarkable that a concert taking place in a suburb outside of Boston proper made it onto the Globe’s “G Section” at all. This just goes to show that Winsor Music has established itself as a respected entity in Bean Town. The Winsor program book is professionally produced, and chock-full of paid commercial advertising. It also contains several pages of financial supporters who contributed at various levels of support (from Partners to Friends). I always pay close attention to this section of the program book and peruse it for leads and associations that might related to my own interests and projects. There were the familiar names – such as David Rockefeller and the Aaron Copland Fund for Music, but also individual personal contributions from some of the movers and shakers of the larger arts world: Peter Sellars, Mark Morris, Benjamin Zander, Robert Levin, Yehudi Whyner, and Lexington residents Wha Kyung Byun and Russell Sherman (to name a few). I was also struck that many of the contributors on the list are familiar to us as Boston-area musicians. The list includes the likes of flutist Fenwick Smith, mezzo-soprano Pamela Dellal (who performed on this concert), violist Kate Vincent, and pianist Lois Shapiro (from Triple Helix). Seeing that kind of support from one’s colleagues must be rather encouraging, and a model that all chamber music organizations would be happy to aspire to. The Boston-area network of professional musicians is a unified and cohesive family. It’s almost as if there are two musical worlds: on one side resides the dominant Boston Symphony Orchestra establishment, and on the other a virtual group of nomadic freelance musicians who provide everything else musical in the cultural space. The road-warrior counter-culture musicians work job-to-job and seem to find enough employment to survive in the non-BSO musical sub-economy. By choice or by circumstance, they are dedicated full-time professional musicians who earn their livelihood from multiple sources of income from a wide-range of ensembles. They work comfortably in diverse venues and in a variety of musical subgenres. These eclectic and versatile performers are well-known to each other and in the professional circles they travel in. To the public, they are seen as associated with one or more branding strategies (e.g. Winsor Music, Emmanuel Music, BMOP, etc). But regardless of the sponsoring non-profit organization, these talented musicians faithfully deliver wonderful music to our city, and as cultural ambassadors they deserve our full support as integral participants in the arts community. I was also impressed with how many “new music” specialists were performing n the large chamber ensemble of Winsor Music. These musicians seem equally comfortable and content performing the music of Bach and Telemann interspersed with challenging contemporary works. There has been a movement in recent decades for musicians and musical ensembles to specialize in one particular era or style. For example, new music groups tend to play only music from the 20 and 21st century. Early music ensembles perform on period instruments utilizing the turning systems appropriate to the age. There are also ensembles that focus on particular composers, regions, cultures, idioms, and styles. For better or worse, concert music has developed into the pastime of specialists. This has been a disruptive phenomenon for some of the older musical establishments, such as the Boston Symphony Orchestra. They are losing their audience and being pressured to perform music that falls within a very limited band of repertory. Educated listeners are more likely today to shun the performance Mozart or Beethoven executed on modern instruments – even if directed by celebrity conductors. Likewise, major orchestras are often surprisingly ill-equipped or not adequately adapted - to perform some of the advanced contemporary music that is being composed at the cutting edge of our time. That leaves the major establishment orchestras with programs that tend to be dry. Often their administrators fall into a pattern which rehash a short list of 19th century war horses, season after season after season. The Winsor Music musicians don’t seem to mind mixing and matching a musical playlist from diverse periods and styles. They are equally comfortable negotiating Baroque-period ornamentation and figured-bass or the rhythmic and pitch complexities of challenging contemporary works. It’s all one happy musical universe to them, and nobody in the ensemble (or in the audience) seems to mind crossing boundaries. In fact, their wide-range of repertory seems not only conscious and intentional, but serves as a deliberate mechanism to balance, contrast, and vary the overall musical experience. People who would not otherwise come to hear an entire evening of contemporary music (e.g. at a Dinosaur Annex or Collage event), might sit through a new work on the program if it were balanced with a fine performance of a Cantata by J.S. Bach. But this eclecticism comes without challenges and compromises. The first piece on the program last evening was the Concerto for flute, oboe d’amore and viola d’amore by Georg Philipp Telemann. It’s an 18th century work that features a trio of soloists where the soloists play both individually and together. Violist Marcus Thompson provided a short “musical instrument petting zoo” demonstration prior to the Concerto. He played on a period instrument, which had seven regular gut strings and seven sympathetic strings. When he played the viola d’amore alone, the audience could hear its’ unique timbre. But when the entire ensemble performed, there were balance problems – even in the small space and fine acoustic of Follen Community Church. The orchestra string players were playing on modernized instruments and bows without gut strings. The other solo parts were performed on modern instruments (flute and English horn), and the huge harpsichord sounded with industrial strength brilliance and amplitude. The replica of the viola d’amore (or a viola d’moor as the original instrument maker may have been thinking), couldn’t adequately compete with the Baroque-ensemble-on-steroids. I suspect that there were other historic compromises as well, such yielding to a modern-day pitch standard set at A 440 and equal-tempered tuning. Yet the musicians, performed the Telemann (and later the Bach) beautifully and without a hint of Early Music-related guilt or reserve. Early Music purists would probably have disagreed too with the use of a female children’s chorus in the Bach Cantata (BWV 115) which closed the evening’s program. Yet, I would be very hard pressed myself to distinguish major differences in timbre between girls singing and boys singing in the closing Chorale. If anything, girls voices provide more pitch clarity and better definition - a deliberately 21st century musical preference. The part of the Winsor Music program that drew me in last evening were the contemporary works. For me, these pieces were the main course. The Baroque music, as nice as it was, provided some historical context and comfort to their base supporters. But it’s the new music that get my juices flowing, and the featured composer that I came to hear was John Heiss. John Heiss is very well known in the Boston area as a composer, flutist, and dedicated teacher. I first learned of him when I came to Boston in the early 1970s where I heard him perform flute with the new music ensemble Boston Musica Viva. I’m also familiar with his compositions as performed by himself and others at the New England Conservatory of Music going back over many years. I remember him before he started wearing his signature visor hat – which today seems to be permanently glued to his skull. I’ve noticed that a number of the composers (past and present) on the faculty at New England like to wear hats (e.g. Lee Hyla). Red Sneakers were big in the 70s. Now it’s hats. Heiss is an expert in extended flute techniques, and recall his Etudes (1979) for solo flute (published by Elkus & Son). One of the Etudes use some very interesting key-clicks that sound much lower than you would think possible on the flute. His introspective and somber Songs of Nature (1974-75) for mezzo soprano, flute, clarinet, violin, cello, and piano (published by Boosey & Hawkes) has been performed often and recorded on Nonesuch (H-71351). I attended the premiere by the Boston Musica Viva in 1975 at the Longy School of Music. Soon after I purchased the score and, and like every other composer who studied in the Boston area, immersed myself in the somber but beautiful work. The fourth song “Men Say” on text by Thoreau, is duet for soprano and flute. A lot is expressed in just over a minute of music. I have also attempted to play the Four Short Pieces (1977) for piano. These miniatures are very much akin to Arnold Schoenberg’s Six Little Pieces Op. 19, and are written in a free atonal musical language. There are spots where 014 trichords are abundant, although Heiss also seems to like major seconds too (e.g. in piece number 2). While I don’t remember all of the specifics, I believe that I did attend the world premiere his piece Inventions, contours and colors at Alice Tully Hall in New York. Heiss wrote it for the new music group Speculum Musicae, and it was recorded for a CRI release on LP by that same ensemble. NEC had a lot of students, and it seemed as if every other student was a flutist. Heiss would get them all together from time to time for ad hoc master classes on contemporary flute works. I sat in on one of these dedicated to the Sequenza for flute by Italian composer Luciano Berio. Assorted flute students would perform the work, and Heiss would make technical recommendations on their playing and speak about the music and how he would be interpret it. It was very engaging, and asked a lot of questions interactively. I remember he asked me what year I thought Berio’s piece was composed in. Luckily I knew it right of the bat, and replied, “1954.” Even in the late 1970s, 1954 in musical terms seemed like “a very long time ago.” I'm convinced that "new music time" passes faster than "biological time." Another treasured annual event at NEC was when Heiss would bring his young daughter to school for a demonstration-performance of “The Owl and the Pussycat” by Stravinsky. Heiss had taught his daughter to sing the 12-tone melody of this penultimate work by the great Russian-American master. After all these years I clearly remember her old-fashioned dress, pig-tails, and the wicker basket she carried. Her singing, expertly coached by her dad, was right-on too. You might think that John Heiss with a B.A. in mathematics and a master’s degree from Princeton University (where he studied composition with Milton Babbitt) would be a staunch 12-tone composer. The opposite is the case. Heiss is skeptical about systems, and prefers to let his ears do the driving. Rather than associate Heiss with serial composers, I think it would be fair to say that the Transcendental perspective of Charles Ives has been one of his major influences in composition. 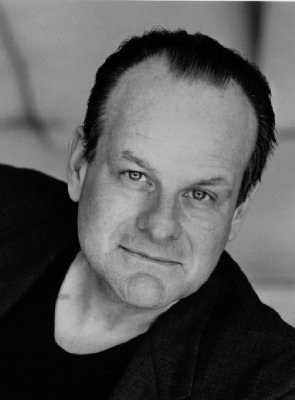 Not only does Heiss have an affinity for music of American roots, but he has taken some Ivesian techniques and incorporated them into his own thinking. One example of this is the technique of taking a well-known tune, and then shifting its’ rhythms around to something unrelated while maintaining the original pitches. Where Ives and Heiss diverge is with regard to extraneous notes and musical clutter. Ives is full of extra baggage, but you will not find an uncontemplated note in any work of Heiss. His music is very lean, deliberate, and highly refined. Perhaps you could say his works are similar to Anton Webern in economy, but exude Charles Ives in spirit. At least when I attended NEC in the 1970s, Heiss had a reputation for instilling a sense of musical reality in his students (e.g. David Rakowski). He would often ask his composition students to execute a complex rhythm which they had just notated in their score, or to sing a line. While I never studied musical composition directly with Heiss, there are many composers who have over the years. His influence as a teacher is formative. With all of this background and history, it is no surprise that I’d want to attend the world première of a revised and updated work by Heiss. Winsor Music had commissioned a new version of his “Sandburg Songs.” I had never heard the work in its original version – which dates from 1963. At the concert Heiss was invited to come up and say a few words about his updated version of the piece. He spoke briefly about the instrumentation and scoring. Originally scored for children’s chorus with piano and bassoon accompaniment, he was glad to take this opportunity to revise it for chamber ensemble. He indicated that the new version improves the clarity of the counterpoint as compared to the original. Heiss noted that the bassoon player who had performed in the original performance was present in the audience, and invited that gentleman stood up and took a bow. Heiss went on to describe the three songs: Limited, Fog, and Freedom is a Habit. “Limited” is about a train, and begins with a musical version of the gradual chu-chu sounds that steam engines exhibit. The musical fabric of the song “Fog” is rather chromatic, and “Freedom is a Habit” is in the spirit of a popular song. The quality of singing coming from the Boston Childrens’ Chorus, was superb. The choir was led by Anthony Treck-King, and his confidence, musicality and skill was evident to all. The concluding song in the set featured some wonderful solo singing by a young singer who was not identified in the program. Heiss’ “Sandburg Songs” were a joy to hear, and were written in a style that hint at a degree of influence from neoclassical Stravinsky, while at the same time this early music is informed by other musical cross-currents of the 1960s. It’s intelligent contemporary vocal music, but performable by children. That’s not an easy feat. At the intermission I caught up with Heiss, who after so many years didn’t remember me from the conservatory. But he was very pleasant and appeared to be very happy to have a work performed with his family by his side. Heiss, now in his early 70s, has two children and three grandchildren. The audience was very enthusiastic, and the composer was greeted by many old friends. I didn’t see many young composers or graduate students at the premiere – as one often does at NEC – but Lexington on a Saturday night is a long way from Boston if you are a student without access to wheels. As a certified people watcher, I couldn’t help but observe that his daughter - who I had last seen 30 years ago singing the atonal “The Owl and the Pussycat” by Stravinsky – is now a grown mother with several children of her own. Oddly enough, her daughter looks just like her when she sang at the Conservatory way back when. Unbeknownst to them, it provided me with a reference point, a “time-warp moment” that reminds one that the clock is ticking. How fast 30 years seems to have passed by! Claude Debussy (1862-1918) would have enjoyed this performance of Clair de Lune arranged and extracted from his piano piece Suite bergamasque. 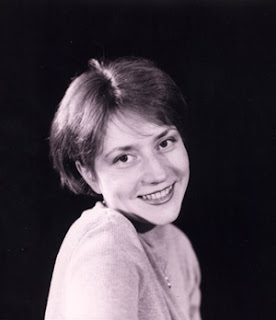 It's performed here by the virtuoso Russian Thereminist Lydia Kavina. Kavina (b. 1967) is the grand-niece of the inventor Léon Theremin (born in 1896 as Lev Sergeyevich Termen, died in 1993). Kavina travels the world playing this unusual instrument, and is a composer as well. Even in the 21st century with all of our technological advances, the magic of the Theremin continues to fascinate us. It is an instrument that is extremely difficult to control and perform on with any accuracy. Trust me, I own one and can speak from experience. As a result, I have a great appreciation of Kavina's formative musical ability. If she ever comes to the Boston area for master classes, I will be sure to sign up for lessons. (She was scheduled a few years back to give a week-long master class at Dartmouth College, but that got cancelled). I'm not sure how she selectively plays two simultaneous pitches at places in this performance. There seems to be some additional electronics involved. If you haven't seen it, I strongly recommend the feature length documentary film about the inventor: THEREMIN - An Electronic Odyssey. It's a Youtube video performance by a violinist who is interacting with a mechanical guitar called the Guitarbot. The Guitarbot was invented and constructed in 2002 by the League of Electronic Musical Urban Robots (LEMUR), of which violinist/composer Mari Kimura is associated. More of this music can be heard on Mari Kimura's CD Polytopia: Music for Violin and Electronics on Bridge Records (9236) released September of 2007. I'm not sure what to say. I don't want to hurt the robot's feelings. Mari plays great! Anyone who lives in the Boston area and has seen a newspaper or TV news program in the past few months is well aware of the heated controversy surrounding the Rose Museum of Contemporary Art at Brandeis University. In January, the university President with the support of the college trustees issued a statement that due to financial strain resulting from a declining endowment, it will be necessary to sell the collection of major contemporary works held in the Rose and redeploy the building for use as a functional studio space for Brandeis students. It’s a complicated debate, and I am not going to take a strong position about the fate of the Rose museum here on this blog – although I’m strongly in favor of keeping the Rose open – but would rather like to offer an observation concerning what I view as a double standard that exists between the visual and musical arts. Just a few years ago the top brass at Brandeis University debated closing several academic departments, and the PhD program in Composition and Theory was on the chopping block. This frontal attack on contemporary music didn’t make a noticeable dent in the mainstream news. It went unnoticed by all but a few students and professionals in the field. In the end, the composition department narrowly survived the ax and was put in the awkward and humiliating position of defending itself to the power brokers of the university strategically, fiscally, and politically. But compared to the high-profile national attention in the media the Rose museum has generated in recent weeks, the plight of Brandeis composers never even made a blip on the radar screen of public consciousness. Disdain for the arts emanating from hard-edged administrators is nothing new – even at distinguished institutions of higher education and enlightenment such as Brandeis (my alma mater). As a composer, I’ve come to accept this state of second-class sub-servitude as part of the deal. As a viable trade where one can earn an honest living, the profession of “composer” simply does not exist, and nobody ever made claims otherwise. But one would hope that, from time to time, there is at least a smattering of interest in serious musical work, and that even in difficult economic times, subterranean environments such as the university will continue to support art and music out of a sense of responsibility, if not guilt or public shame. Even in the best of times, contemporary art needs the maintenance of “life support,” but the niche of new music has always been extremely vulnerable and requires “intensive critical care” for its continued survival. It seems that we are in a different age. Responsibility has fallen by the wayside, and the negative press generated by guilt can be managed by a publicist. Today we are reading about loss of vision and abandonment of responsibility concerning the Rose Museum, about corrupt and incompetent AIG Executives who shamelessly cash their fat public-financed bonus checks, as well as the repercussions of the Madoff meltdown (which have impacted the Brandeis endowment as well as others). I believe the sad predicament that plagues the new music business is largely related to inferior public relations and the lack of a proper market. Dealers and traders who work in the contemporary art space have managed to create a functioning system of perceived value. Commissioning and purchasing a painting or sculpture by individuals has grown quite commonplace. But for some reason, the idea of commissioning or paying for a musical performance is rare beyond belief – unless there is a significant tax deduction for high-net worth individuals or corporations associated with it. It’s true, you can’t hang a piece of music conspicuously on your wall and later resell it at a handsome profit, but you can enjoy it for the moment and share the unique experience with others. Lenny Bernstein did children's concerts better than anyone. His NY Philharmonic programs were always different, televised, and interesting for all. I discovered an excerpt of Gunther Schuller's "Journey into Jazz" (written in 1962) with Bernstein as narrator. This performance in Avery Fisher Hall dates from 1964. The text is a children's narrative by Nat Hentoff. It tells the story of a young boy named Eddie Jackson ("Peter" in this version) who learns to become a jazz musician through hard work, practice, and life experience. It looks like the jazz musicians are an all-star cast, with Don Ellis, trumpet; Benny Golson, tenor sax; Eric Dolphy, alto sax, flute; Richard Davis, acoustic double bass; Joseph Cocuzzo, drums; backed up by the New York Philharmonic Orchestra. Gunther Schuller is the conductor. In 1962 the Young People's Concerts were the first programs to be televised from Lincoln Center. Bernstein conceived and conducted a total of 53 shows. They were all broadcast on CBS and syndicated in more than 40 countries. Bernstein left the NY Philharmonic as music director in 1969, but he continued to lead the Young People's Concerts as a guest conductor until 1971. Not only does the video bring back memories, but I think the shows were more insightful than the pretentious "Charles Elliot Norton" lectures that he delivered at Harvard in the 1970's. "Music is being made. Come on in." The economy got you down? From the soundtrack of the 2007 movie No Reservations we hear the delightful tune "Truffles and Quail" composed and conducted by Conrad Pope. 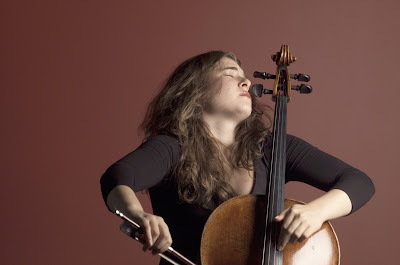 This coming week the Boston Symphony Orchestra will host the young American cellist Alisa Weilerstein. She is a former Boston resident, having lived in the North End for two years. Weilerstein is a rapidly rising star in the classical musical world, and has already forged a formative career since her debut with the Cleveland Orchestra at the age of 13. Weilerstein will perform the Brahms Double Concerto with Dutch violinist Janine Jansen and the Boston Symphony Orchestra conducted by Hans Graf on March 19, 20, 21, and 24. Performing Penderecki's savage Second Cello Concerto last year with the New York Philharmonic, Weilerstein says, her bow began to take on characteristics of a knife, and she began to feel like a murderer. It was a state so consuming, and so hard to snap out of, she had to force herself to take her bows. "We have the darkness inside of us, and it's easy to be afraid to go there, But the music demands it," Weilerstein says. "So you find it." This kind of consuming passion is what inspires composers and listeners alike. It's a statement of commitment to the music that mirrors the psychological and emotional process that composers go through to create the music in the first place. The "darkness inside" is an apt description for the psychological venting we hear in much modern music, and quite representative of the inner turmoil that some composers go through as they reveal their innermost ideas in the form of little dots scribbled on the page. It's good to hear a performer who is willing to assume the dangerous but vital role of faithfully executing the composer's intentions, even if it is a musically violent act. For the composer, the contemporary pallet of emotions should include the entire spectrum of expression, and at times the composer may call upon the performer to portray intense "rage." The dark side of emotions should not be banned from the concert hall, even if it makes some of us uncomfortable. Weilerstein couldn't be more succinct and wise with her comment... "The music demands it." One would hope that Weilerstein will keep the fire of unremitting passion alive in her rocketing musical career. She appears to have a talent and willingness to be a vessel for contemporary composers, and to perform their new works with the same intensity and passion that they were created with. Even if these works explore musical realms that create a degree of Existential dissonance, she's willing committed to include it on the menu. 1) Aaron Copland composed was to become an iconic piece titled Fanfare for the Common Man. Milton Babbitt responded with his brass quintet Fanfare for All (1993). Meridian Arts Ensemble performed Fanfare for All in Timosoara, Romania in November of 2007. The short work was commissioned by them, and is published by Peters Edition (P67610). Members of the ensemble are: Jon Nelson - trumpet 1, Tim Leopold - trumpet 2, Dan Grabois - French horn, Ben Harrington - trombone, and Raymond Stewart - tuba. 2) All Set (1957) is scored for alto sax, tenor sax, trumpet, trombone, bass, piano, vibraphone, and percussion (trap set). This jazzy work was performed by Mobtown Modern Music on December 15th, 2008 at the Baltimore Museum of Contemporary Art. 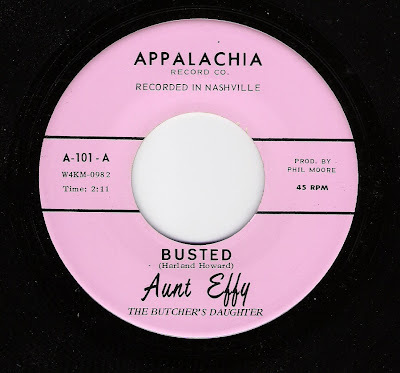 The work is published by Associated Music Publishers, Inc.
A new video has just started making the rounds on the Internet. Everyone who has a "new music" blog seems to have a link to this piece, and I can see why. It's a YouTube of a musical arrangement (with dance) of Semi-Simple Variations (1956) by 12-tone composer - and modern music legend - Milton Babbitt. Great job guys! "The Bad Plus" play Babbitt's highly complex serial piece with real swing on this video. The tune can also be found on their album "FOR ALL I CARE." Babbitt (b. 1916) grew up in Mississippi, and played jazz saxophone in dance bands during his youth. There is a natural bebop-like swing to his work which probably stems from his early roots in jazz and popular music. It is said that Milton can sing any Cole Porter song from memory, and not miss a word. But his "serious" music is DEEP. I mean really DEEP. It's quite possible that Babbitt has written the most complex music ever composed in the history of civilization. I'm not kidding. Some composers and music theorists refer to Milton's early piano piece Semi-Simple Variations and other works from the 1950's as "Baby Babbitt." Although we mortals can piece together the construction and design of his early work with the aid of scholarly articles (such as the 43-pager that Christopher Wintle published on this short piano piece for "Perspectives of New Music"), later works by Babbitt defy formal analysis by non-specialists. That's why I picture him in outer space. He is not of this world. Babbitt, as down-to-earth and friendly as he can be, would probably serve as our best hope for communicating with an advanced alien civilization. If it turns out that aliens communicate using the science, mathematics and language of sound (as in the movie "Close Encounters of the Third Kind") - then Babbitt would by default be Earth's best hope as an Ambassador. 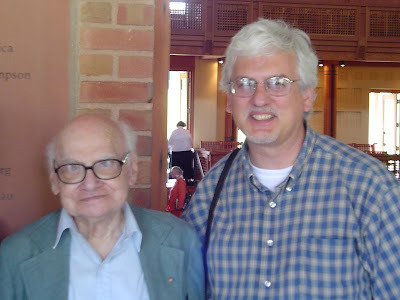 Here is Babbitt with yours truly at Tanglewood in the summer of 2005 (photo on right). He has been a supporter of mine over the years, including with the practical matter of recommendations. Babbitt wrote the following in support of my orchestral work "Tone Poem." Mahler's score calls for four horns, but it was the practice of the time to have an extra player on hand to seamlessly alternate with the other parts, especially in famously difficult and lengthy works such as this one. Those of you who know me are aware that I don't have a sports bone in my body. For the most part, I can't speak the lingo, don't know the rules, and can't follow it on TV. But there was excitement in my house last evening when the Dutch underdog baseball team pulled off another major upset in Game 5 (pool D) of the World Baseball Classic in San Juan, Puerto Rico. They came from behind in the 11th inning to beat the Dominican Republic with a score of 2-1. The game went on for hours. It was an unexpected second upset of the Dominican team by the Netherlands, and it qualified them to play in round 2 tonight in Miami against Puerto Rico. Out of curiosity, I occasionally monitor the statistics on this site and my composer web page for the number of "hits" they receive. I get very little traffic, since the blog is more of less a private page for friends and family, and my composer website does not attract much attention at all. Historically, both sites have gotten one or two hits on per day and those hits originate from around the globe. Something changed around January of 2009. My composer website is now inundated with hits from China. There is a website known as Baidu that links Chinese users to MP3 music files, and it has apparently included my recorded music in their library. The name 'Baidu' was inspired by a poem written more than 800 years ago during the Song Dynasty. Baidu is the leading search engine for websites in China for audio files and images. It provides an index of over 740 million web pages, 80 million images, and 10 million multimedia files. The search engine attracted at least 5.5 million visitors last year. All of my audio files have had a surge in downloads. There were 2,726 downloads originating from China in just the past month from Baidu. Of course I do not receive any payment for sharing my music (nor do the performers), but it's nice to know that someone is listening to it. In actuality, I have never earned a single penny from my musical compositions, so I see no reason to change my business model at this late stage in the game. There are also "free" scores available in Adobe PDF format on my composer website. It appears that there is some interest in those scores coming from Germany. A number of people have downloaded copies of my yet-unperformed works (i.e. Tone Poem for orchestra and the Piano Quintet). It would be interesting to learn if these works find an audience after all of these years. Mount Vesuvius is located only 27 Km from Cervinara, the town in Italy where my family came from. Although its last significant eruption was in 1944, something on the scale of the AD 79 event that leveled Pompeii and Herculaneum is predicted to occur in the future. Perhaps this sense of impending danger contributed to the motivations that inspired my forebears to immigrate to America. 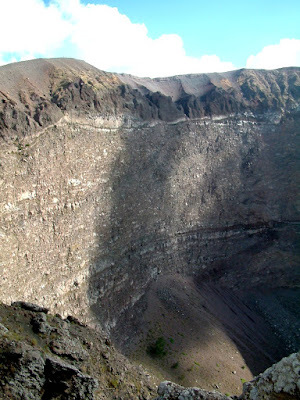 The active volcano has an elevation of about 1200 m, and can be accessed today by a road leading up to the crater through the Parco Nazionale del Vesuvio. The images of Vesuvius on Google Earth are vivid. You can interactively explore the crater and surroundings by dragging your mouse on top of this detailed embedded satellite image and zooming in and out. If you zoom in on the access path to the crater at the upper left side of the photo, you can clearly discern the shadowy images of people walking to and fro. On Wednesday I had lunch with Kim Novick at Ristorante Bertucci's at the Alewife MBTA station in Cambridge. Kim is a high powered Internet marketing executive and consultant who specializes in hybrid-experience design and brand strategy. I've known him for about 40 years - since High School. Kim is just back from a business trip to NY, and is full of great ideas, enthusiasm, and all-around insightful information. We talked about technology, world affairs, the environment, and potential areas of business opportunity and professional career development. I ordered the sausage and pepper focaccia sandwich, and Kim went for a bowl of minestrone soup and a large side dish of broccoli (without cheese sauce). Oh yeah, Kim is a certified Deconstructing-Jim blog addict. 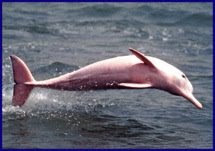 This photo of a rare "pink" bottle nose dolphin was taken at Lake Calcasieu, Louisiana by a local charter boat captain, Erik Rue. 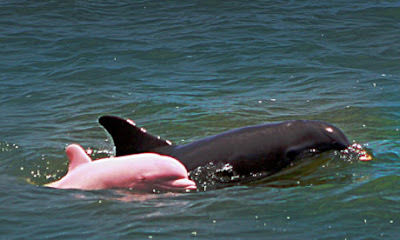 Lake Calcasieu is an inland saltwater estuary, north of the Gulf of Mexico, and the dolphin is an albino with reddish-colored eyes. It brings to mind the title song of the 1947 movie with Lana Turner: "Green Dolphin Street." The song became a jazz standard performed by Ella Fitzgerald, Miles Davis, Sonny Rollins, Stan Getz, Bill Evans, and many others. Every Berklee student learns it in their first semester. Here is John Coltrane performing the tune in Dusseldorf Germany in March of 1960 with members of the Miles Davis Quintet (without Miles). Wynton Kelly, piano; Paul Chambers, bass; Jimmy Cobb, drums. Monday March 2nd. Today we have 15 inches of snow on the ground, the Dow Jones industrial average is falling like a rock (below 7,000 for the first time in a dozen years), and I can't get "The Hello Song" out of my head. Actor David Paymer plays a person who is psychologically challenged residing in a mental institution, and he is obsessed with the word "Hello." It is pretty much all he says for the duration of the movie: "Crazy People" (1990) which stars Dudley Moore and Daryl Hannah. Emory (played by Dudley Moore) works in Madison Avenue as a top advertising executive, but is beginning to have a nervous breakdown from all the pressure. He sent to a psychiatric hospital to recover. By way of a comedy of errors his fellow patients begin collaborating with him on advertising slogans and ideas. From this creative synergy the "The Hello Song" is born. This YouTube clip leads up to "The Hello Song" and includes some background scenes. Ever since seeing this movie, I've been struck by the economy of text in this song. It's actually very well constructed and phrased. It is easy to see how someone can be obsessed with the word "Hello." It's much better than "Goodbye." In January of 1941, the musical Lady in the Dark by Kurt Weill (music) and Ira Gershwin (lyrics) opened on Broadway's Alvin Theatre for a run of more than a year and 467 performances. It's in an interesting form: except for the final song, all the music in the play is heard in three extended dream sequences (the Glamour Dream, the Wedding Dream, and the Circus Dream). Each of the psychoanalytic studies stand as micro-operas within the overall work. 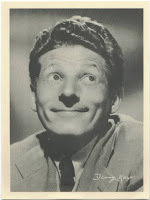 Danny Kaye (David Daniel Kaminsky), was born in 1913 in Brooklyn NY the son of an immigrant Russian tailor. He dropped out of school at age 13, but found work in the “Borsht Belt” and in vaudeville shows. 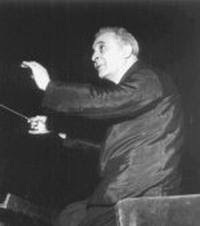 He studied music seriously, including music composition, and once conducted the NY Philharmonic.